At the beginning of January I set a goal to read 50 books throughout the year. I've mentioned many times how much I love reading, it's always been one of my favorite activities to do. Since I read a handful of books each month I thought I would try to post at the end of each month which ones I've chosen and a brief recap. I love seeing what others are reading and maybe you're the same way. 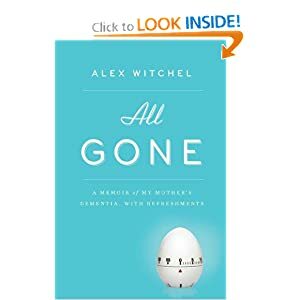 All Gone: A Memoir of My Mother's Dementia seemed to be a perfect book for me to start the year off with. My grandmother is suffering from dementia right now and as a family we are still struggling to understand this disease. It's hard on everyone, she has days where she's just fine and then others where she's constantly repeating herself, asking the same questions and even hallucinating at this point. In the midst of reading this touching memoir I could relate to the author a little bit. I could feel her heartache for what she was going through. She found comfort in her mom's recipes, cooking meals and dishes that she grew up with were a big help in dealing with everything. I loved reading the stories of their family, stories behind these dishes and of course the recipes all sounded wonderful as well! I've had this particular book for many years, I believe I picked it up at our local Christian bookstore when I first had gotten married and was starting to work from home. I know I've started to read it before but couldn't remember if I had ever finished it or not. Living Simply was an okay read to be honest. It wasn't one of my favorites. The author definitely made some good points; I totally agree with her when it comes to not having our schedules so jam-packed, keeping Sundays open to spend time with family and eliminating excess clutter from our homes as much as possible. I came across this at our library one day and thought it looked interesting, mostly because the author is from Iowa and she writes a newspaper column filled with tons of tips for homemakers, as well as updates about her own family and neighbors. Always Put in a Recipe and other Tips for Living was an interesting and quick little read. 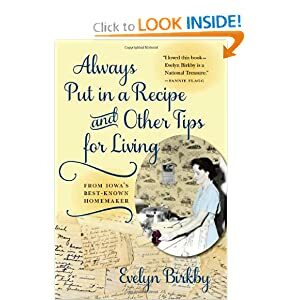 After writing for 63 years, Evelyn has compiled some of her favorite columns into one book. You'll find everything from recipes, what it's like to live on a farm and even stories about her own family traditions. 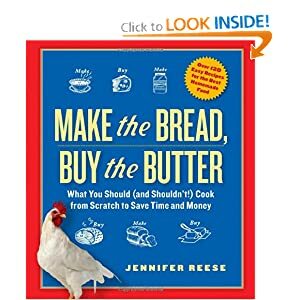 Make the Bread, Buy the Butter was by far one of the best books I read this month. I would consider it a cookbook but it's filled with so much more than just recipes. Jennifer shares tons of recipes to help you cook from scratch more while saving time and money but she also tells lots of hilarious stories too. The book is broken down into different categories such as breakfast dishes, desserts, chicken, ducks, etc. There were quite a few recipes I'd like to try myself sometime. This is one book I definitely recommend you to read, I think you'll get a kick out it! This was actually on my reading list from last year and I just never got around to it. 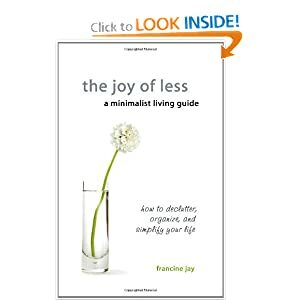 If you're looking for a good detailed book to help you eliminate clutter, get your home more organized and just overall simplify life in general; then I think The Joy of Less is a great read for you. 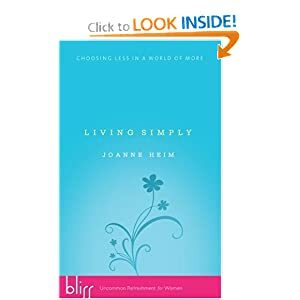 The author breaks the book down into four different parts, she helps you understand the benefits of a minimalist lifestyle. You'll find in part three a detailed plan to help you go through each room of your house and eliminate the excess clutter. You'll be forced to really think about each possession and if it's really necessary in your home. I didn't actually do any of the steps outlined, I simply just wanted to read the book but I certainly did feel the need to do some decluttering afterwards! The final book I read for the month was A Homemade Life: Stories and Recipes from my Kitchen Table. I picked up this book last July while on vacation and now I'm kicking myself for waiting so long to read it! What a great memoir, seriously. It was very hard to put this book down each night and actually go to sleep. 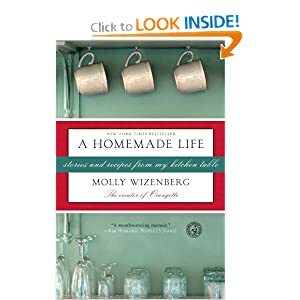 I loved all of Molly's stories and her recipes are just wonderful. The book itself is composed of several stories from her life, I know you'll find yourself laughing right along with her and maybe even catching yourself with a tear in your eye. If you love to read and you love to cook, then this book is just right for you. Did you read any good books this month? Please share them in the comments, I'd love to hear! Here's a peek at my stack for February- I can't wait to get started on these! I really want to read that last one listed, A Homemade Life....will have to see if my library has it!